Players travel in circles from region to region building castles to control the regions. A fast-paced game of castles, politics, and changing fortunes. Carolus Magnus is an unusual, but very interesting, offering by my personal favorite designer, Leo Colovini. In this game, players vie for control of islands through strategic placement of cubes. Cubes can be played in two places, either in your court, or on the islands themselves. Cubes in your court determine who controls the cubes on the islands. For example, if you have 6 blue cubes in your court, and your opponent had 5 or less blue cubes in his court, you would control all blue cubes out on the islands. After playing cubes, a player then moves the emperor. The island that the emperor lands on is then analyzed. Whoever has control of the majority of cubes on the island places a castle on it. The first player to play all of his castles is the winner. This game truly has the most interesting game mechanics I have ever seen in a game. If you like strategy/abstract strategy games, this is a real winner! This Leo Colvini masterpiece is great. Plays well from two to four players and plays in less than 30 minutes. Another hit in my book. This is probably Colovini’s best design. It’s an interesting political/abstract game that’s easy to learn and plays extremely fast. It has very nice components with a medieval theme of building castles for the Emperor, Charlemagne. There are 15 territories in which you are trying to get control of through the 5 clans of paladins, represented by the 5 different colors. You use color-coded dice to randomly get the paladins into your reserve. From there you can move them into your court, to gain control of Charlemagne’s court or into a territory for a possible take-over and build a castle. Your goal is to get all your castles into the territories before your opponents. Nothing is guaranteed, and you can easily loose control of the courts and territories. There’s a turn order process that you need to manage to best gain an advantage in the courts and over the territories. 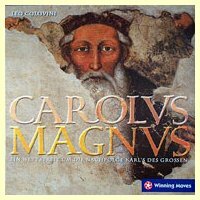 The more I play Colovini’s games, the more I like them, especially, Carolus Magnus! This is another area majority game, similar to many others, but different in one very important way. Instead of just competing over fixed territories, in Carolus Magnus, the territories can actually merge which adds a very innovate element of direct conflict between players.